Looking forward to tonight’s performance at the Dreamland Film Center in Louisville KY. Jonathan Wood and I will both perform solo sets. Adam Bowles and Kathryn Fouse close out their four city tour of new compositions for piano duo on Tuesday, Nov. 5, 1:15 pm at Shelton State University, Tuscaloosa AL. The tour is presented by the Birmingham Art Music Alliance. 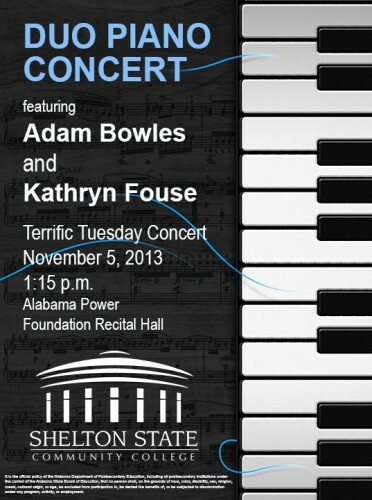 They’ll perform a program of new compositions for piano duo, including my piece Cypher, A Circle.